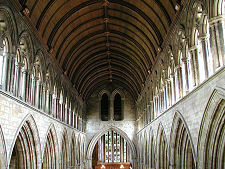 Dunblane Cathedral would probably not feature in anyone's list of largest, grandest, oldest or most famous cathedrals. But if you're compiling a list of those with the most charm or character, then it must be a strong contender. From the outside of the Cathedral this character isn't immediately obvious. It is set in a very nice precinct but is otherwise unspectacular. And then you start to notice the tower. It's clear that top half wasn't constructed at the same time or of the same material as the bottom half. Much more subtle is the way that the alignment of the tower differs from the rest of the cathedral, something that gives some odd visual effects as you view it from different angles. The second real oddity is only obvious from the inside. As you walk round the nave you gradually begin to realise that the interior stone of the cathedral seems as weathered as the exterior. When you add to this the complete lack of symmetry in the overall design of the cathedral, the end result is truly unique. And wonderfully attractive. Christianity in Dunblane stretches back to St Blane's establishment of a monastery on the site of an old Roman fort (or "dun") here in about AD600 (hence the name Dunblane). The first stone church was built on the site of the cathedral in or around 1150, and at the same time a separate four story tower was built close by, probably for defence. 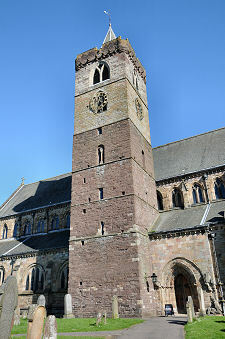 The development of a building on the scale you see today began in 1233 when the earlier church was vastly expanded and the misaligned tower incorporated into the overall design by the new bishop, Clement of Dunblane. 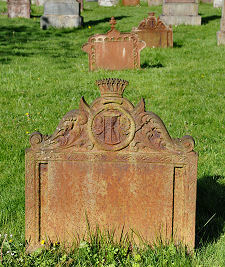 Further developments took place over the following three hundred years. These including the addition of the top part of today's tower. 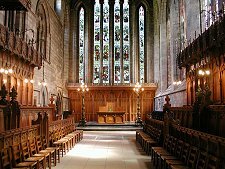 By the 1550s Dunblane Cathedral was a splendid place full of statues, paintings and stained glass windows. There were also eleven altars. This all came to an end with the Reformation in 1560. The splendour was swept away and the cathedral changed dramatically. 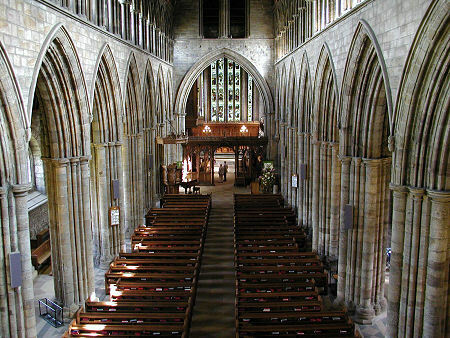 The choir remained in continuous use, but by 1600 the roof of the nave had fallen in and the western two thirds of the building was simply left in ruins. The end result must have looked very like Dunkeld Cathedral does today: a fairly small active church attached end-on to a larger roofless shell. The nave was to remain roofless for the better part of three hundred years, which explains the way the internal structure has weathered, apparently within the sound building you see today. 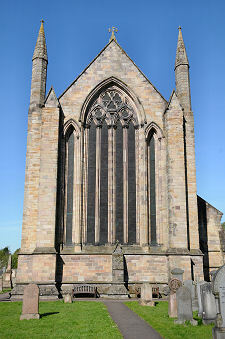 The upturn in the fortunes of Dunblane Cathedral began in September 1889, when a complete restoration was begun, thanks to "the piety of Jane Weir" who largely funded the work. It was completed in October 1893. Over the following years, the woodwork increased in quantity and magnificence, and stained glass was steadily reintroduced into the cathedral. There is technically no such thing as a Cathedral in the Church of Scotland, but the name remains in recognition of its history. 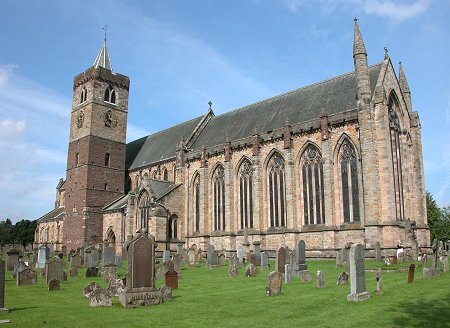 Today's Cathedral serves as an active parish church for Dunblane. It is maintained by Historic Environment Scotland, one of whose custodians is usually available on the premises to provide further information. 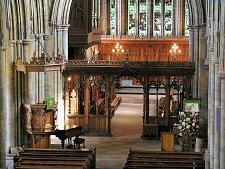 For the visitor, Dunblane Cathedral is built on a pleasantly human scale. It is not too large to take in as you wander around. The largest single space is the nave at the west end, complete with the superb roof added around 1890. The whole space is best viewed from the gallery below the west window, reached by a narrow spiral staircase. 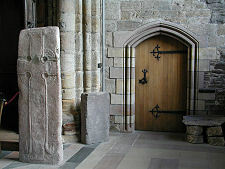 Highlights in the nave include the oldest and the newest pieces of stone on view. In the south west corner is a standing Pictish stone cross, dating back to the ninth century. It was unearthed from under the chapter house floor in 1873. 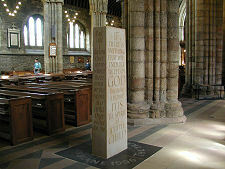 Very similar in scale is the cathedral's newest piece of stone, the poignant Dunblane Commemoration, unveiled here on 12 March 2001 to commemorate the tragedy that took place in the town on 13 March 1996. The cathedral's east end is given over largely to the choir, complete with its magnificent woodwork. 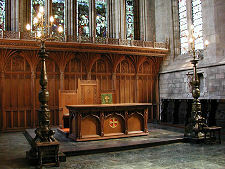 The stalls, altar, organ and screen were all gifted to the cathedral in 1914. And when combined with the stunning east window, whose stained glass dates from 1901, the effect is quite enchanting. On the north side of the choir is the chapter house, which also serves as a memorial to members of the congregation who fell in the two world wars. 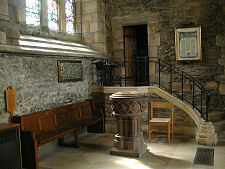 This is one of the oldest parts of the cathedral, and may incorporate elements of the original church built around 1150.